"When science and spirit meet in the coaching process ... Miracles happen! "To me, 'The "God" in Coaching' is a bible for actualizing our human potential." "With the rapid advancement of coaching, many new books about coaching have been published with the intention of helping coaches accelerate their coaching practices. 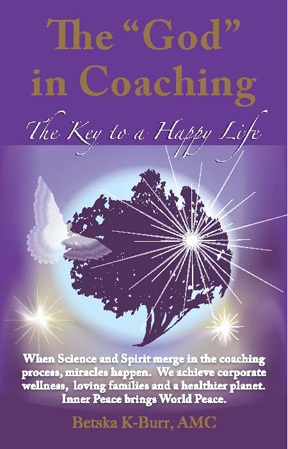 But no expert before the publication of Betska K-Burr's book has assembled the variety of deeper levels or empirical, spiritual, psychological and bio-neurological foundations that will definitely enable coaches to transform themselves from being good to being great. This book with its clarity of definitions, brief, yet instructive cases studies, personal stories about changes in consciousness and their impact on coaching practice, ability to translate complex ideas into easy to understand coaching practices, engaging poetry and helpful charts, is one of the first to focus on how the laws of human development, the characteristics of contemporary society, and the evolution of consciousness all impact coaching outcomes. The wide-ranging topics, all clearly necessary and neatly assembled into an integrated whole, even include a wonderful, and often ignored, section on how the seven stages of eating habits relate to coaching practice. The beginning chapters in this book provide a thorough and easily readable foundation for what is probably the most revolutionary and effective model of coaching to be developed in the last ten years, Betska K-Burr's Power Coaching® with Mind-Kinetics®. In the later chapters more details are provided to illustrate not only how this model works, but also, through the use of coaching session deconstruction, why the model works as well. This model, known as "PCMK", is truly unique, and I'm sure will serve as both a source of inspiration and as a beacon to light the path to coach effectiveness. .... This is a great book. I loved the mix of personal into the realm of concepts and practices. Betska, the way you write in book is highly congruent with what you talk about in the book. You walk your talk! Your humour was noticed and appreciated!" 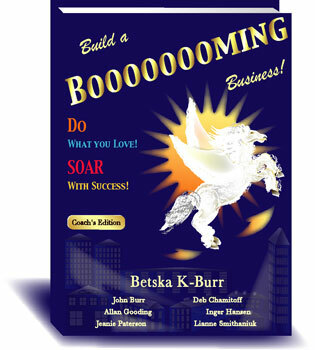 "Betska K-Burr’s book 'The "God" in Coaching' shows you how to use the most powerful resource in the Universe to create your ideal life. She explains how your subconscious mind is programmed to live the life you’re currently living and if you want more from life you have to change that programming to reflect the life you want live. It’s Brilliant." "This book is about the great power for healing by people helping one another. Deeper than that the author involves personal health with societal health and the health of our Earth. This is what real holistic health means and the book gets it across brilliantly." "'The "God" in Coaching' brings a degree of wisdom and depth to the subject of coaching that you'd be hard-pressed to find elsewhere, a comprehensive approach encompassing all the dimensions of the human spirit." Using our highest wisdom, our Godself, we can put an end to sickness, unhappy workplaces, high divorce rates, drugs, starving children, natural disasters and the torturing and suffering of humans and animals alike. 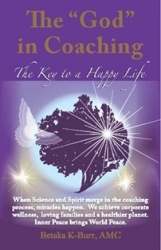 Coaching enables us to change our planet into a heaven! With it we can create a happy, healthy, abundant and enlightened world where noble human beings live in peace and harmony. Affectionately known by her Clients as The Guru Coach™, Betska K-Burr offers to magnify our corporate and personal life success with her award-winning coaching methodologies. Betska....I forgot to mention, I finished your book a couple weeks ago and meant to send you my congratulations. What a beautiful book and wonderful information for all coaches. I was amazed at how much you shared with everyone.....a real treasure. Thanks for writing it!